Adolf Jensen (1837–79) is one of the major figures of German Romanticism. Though he died early, he composed a large corpus of songs and piano music, in a language fusing the heritage of Schumann, Chopin and Liszt into an individual style distinguished by its melodic and lyrical appeal. 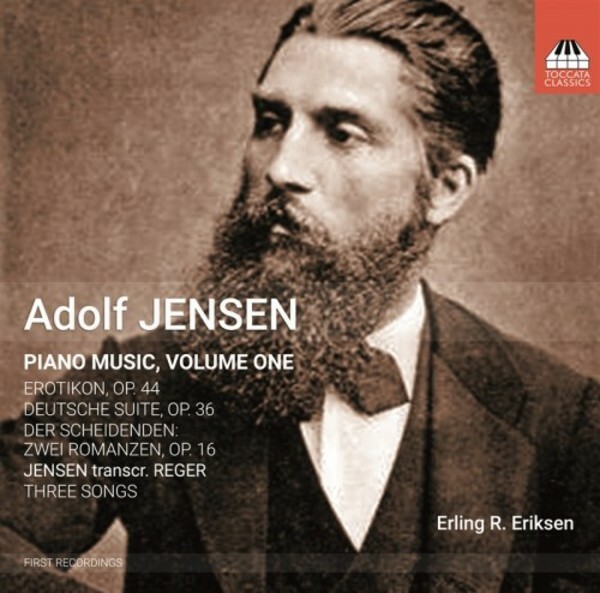 Yet Jensen has been almost entirely forgotten: there is almost nothing of his huge output of piano pieces and songs available on CD. This first in a series of recordings of his music hopes to restore his name to circulation. The extensive booklet notes are by one of the experts on nineteenth-century piano music, Rohan Stewart-McDonald. Erling R Eriksen is professor of piano in the Department of Music and Dance at the University of Stavanger. This is his third CD for Toccata Classics. In recent years Eriksen has given master-classes in Guangzhou, Nanjing, Paris, Pescara, Rome, Stockholm and Weimar. In 2000 he was awarded the Grieg Prize for services to Edvard Grieg and his music.